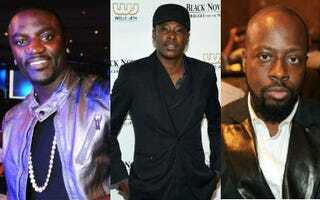 (The Root) — Akon and Wyclef Jean are hoping that the upcoming film they're in, Black November, does for the Niger Delta what Kanye West's song "Diamonds From Sierra Leone" did for blood diamonds. Black November, by writer and director Jeta Amata, tells the story of how big oil has devastated his homeland of Nigeria. It mixes Hollywood with Nollywood by taking the audience on a trip from the roadways of Los Angeles to the villages of the Niger Delta in Africa. For first-time actor Akon, who hails from Senegal, his small part in Black November was literally a labor of love. He told The Root: "This message should have been told a long time ago. There is so much extraction of natural resources in Africa, but it's actually corrupting the land and killing off the people, and no one is doing anything about it. And now oil and energy happen to be the big thing." Nigeria is the 10th-largest producer of oil in the world, according to the U.S. Geological Survey, and Africa's leading crude producer (pdf). Yet the nation ranks at the bottom when it comes to prosperity. The unemployment rate is 21 percent, according to The CIA World Factbook, with 70 percent of the population living below the poverty line. When Amata began his movie more than three years ago, the military was still in command of Nigeria. By the time Black November was completed, the country had its first democratically elected government. "The fact that I am making a film like this and presenting it to people like you means there is change and there is a possibility for more change," he told an audience of international dignitaries, human rights leaders and celebrities at a screening of the film last week at the United Nations during its all-important General Assembly. Amata spares no one — not the government of Nigeria or its people, and certainly not the multinational oil companies — when it comes to laying blame for the problems in the Niger Delta. He told The Root: "Remember the Exxon Valdez? It's 50 years of the Exxon Valdez we've had, at least once every year, and it hasn't been cleaned up, and the people from the Niger Delta don't get any compensation. So the question is, whose fault is it? Is it the government, is it the oil companies or is it the people? That's what Americans should know, and that's why I made the film so they can see it and judge for themselves." The film also features Mickey Rourke, Kim Basinger, Anne Heche, Vivica A. Fox, Mbong Amata and Persia White. Wyclef Jean told The Root that working with the Oscar-nominated Rourke and Oscar-winning Basinger was "incredible, and they made the whole cast feel very comfortable." Jean plays a Nigerian who walks the fine line between rebel and freedom fighter. He took the part because "for me it's a good cause." The musician and activist has had a lot of causes lately — most notably in Haiti, where he ran for president — as well as Tibet and the arts in public schools. As for the Niger Delta, he said, "I think it's important that we give this light and understand ourselves. If you're going to make money in other countries, it's important to help those countries, too." After the screening, the Rev. Al Sharpton told the audience that "this story is our story." The activist and MSNBC host also offered to help get the word out: "We should be committed to make the drama of this movie awaken us to stand up to what is going on in Nigeria and going on all over the world. Black life must have value. That's what this movie's about," he said. Black November opens in the United States on Dec. 7.